1 Mirandese, spoken in some villages of the municipality of Miranda do Douro, was officially recognized in 1999 (Lei n.° 7/99 de 29 de Janeiro), since then awarding an official right-of-use Mirandese to the linguistic minority it is concerned. 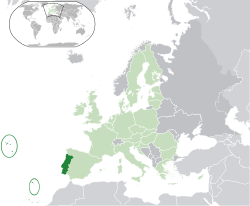 The Portuguese Sign Language is also recognized. 2 Before 1999: Portuguese escudo. Potugal em i kantri bilong Yurop. Emi memba bilong Yunien bilong Yurop. Kapitol bilong Potugal emi Lisbon. Tokples bilong Potugal emi Tok Potugal. ↑ Pordata, "Base de Dados Portugal Contemporâneo". Accessed on March 7, 2011. ↑ 3.0 3.1 3.2 3.3 Portugal. International Monetary Fund. Retrieved on 6 May 2011. ↑ Gini Index. Instituto Nacional de Estatística. Retrieved on 14 July 2011. ↑ Human Development Report 2010. United Nations (2010). Retrieved on 5 November 2010. ↑ The Euromosaic study, Mirandese in PortugalTemplet:Dead link, europa.eu – European Commission website. Retrieved January 2007. This page was last modified on 7 Epril 2015, at 09:44.